I can’t believe it’s been over a week since it was Thanksgiving. I feel like I’m still eating leftovers! Ha! I hope you all had a lovely holiday. Not only was it Thanksgiving but I also celebrated my birthday the day before. Needless to say I was feeling extra grateful for all the momentous gatherings. My apologies for lack of posts, I have been getting my party on! In the last week since we have talked I turned 24 (yahoo! ), been working my toosh off and we got a dog! Yes yes yes! If you didn’t know it has said in my “about me” for like forever that one of my future goals is living near the beach (check, we’re twenty minutes!) and getting a dog named Rascal. #feelingaccomplished. His name is Rascal! He is an 8 week old golden retriever. I will do a whole other post about Rascal, I promise! For now just know he is a cuddly ball of joy and he has been a blast to have around. I won’t sugar coat it, it’s a large load of work but the fun outweighs the tough. He is our little golden nugget and we already love him! For daily updates of the little guy check insta stories and insta posts (@college_housewife). This last week or so I have been missing our two favorite friends (Katie and Ryan) a TON! They were our partner couple in crime and I would love nothing more then to have them as our guests for the Holidays. I got to thinking and I’m sure all of you are having tons of house guests this month! Don’t get me wrong but having guests that are on vacation usually brings a hangover or two, am I right?! I know I bring out my best batched cocktails around all of the festivities. I brought you guys this recipes because it’s seriously great for a rough morning! It’s not too greasy and it’s full of warm and gooey carbs. While I’m sure we should all be drinking green juices and wheat grass shots that is the absolute last thing I want when I’m hungover! 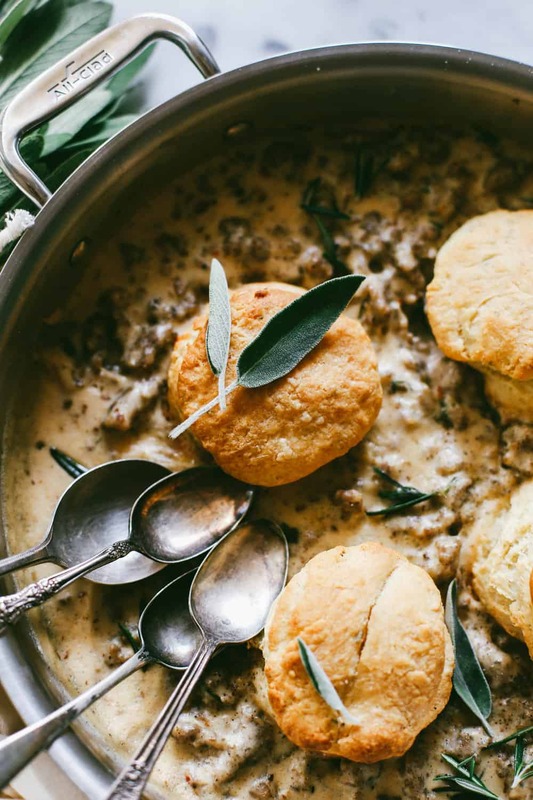 Make some biscuits and gravy, have a gallon of water by your side and enjoy a lazy day with great company. This recipe is so wholesome. It’s the type of food that you want to sit in your lounging clothes all day on the couch with and watch movies that you can get lost in. If you have never make homemade biscuits you are missing out! 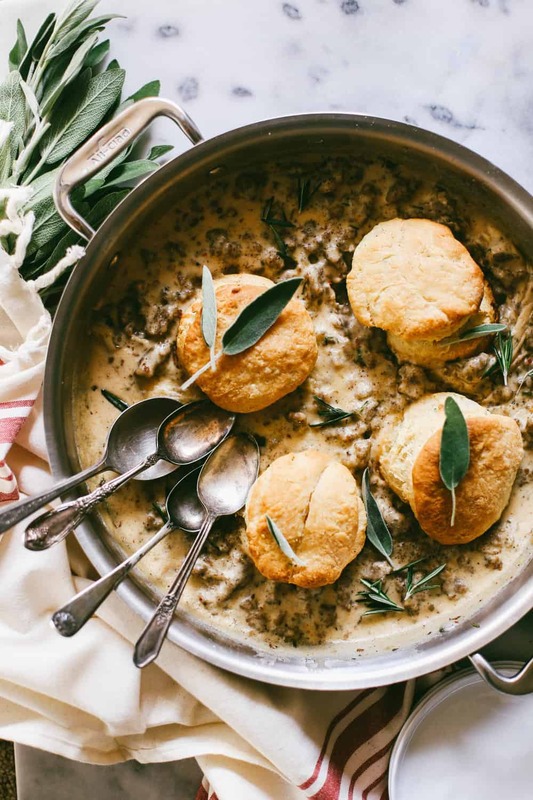 While I love a good canned flaky biscuit, homemade is just where it’s at. This recipe is really easy! Should take you less than an hour to get together and you are home free! Combine flour, baking powder, brown sugar, salt, honey bourbon and butter in a large bowl. Blend mixture with a pastry blender until crumbly. Add in milk and stir until a ball forms. Transfer dough to a floured surface. Pat down into a rough rectangle and fold over 4-6 times. Cover dough with a wet towel and let rest for 30 minutes. Cut dough with a glass or biscuit cutter. 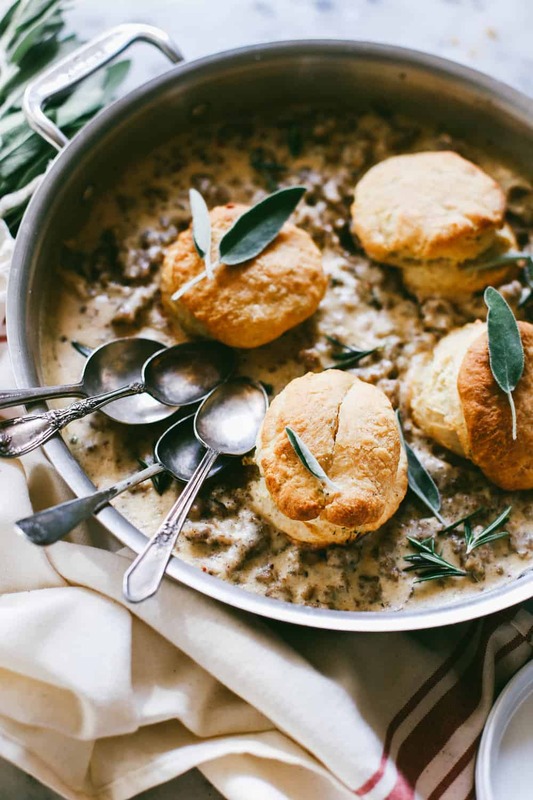 Arrange biscuits on baking sheet and brush with melted butter. Bake for 15 minutes or until golden brown. In a large frying or braising pan cook sausage on medium heat until cooked through. Add sage, rosemary, pepper, and flour and mix. Add in milk and heat on medium low until boiling and gravy has thickened, about 10-15 minutes. 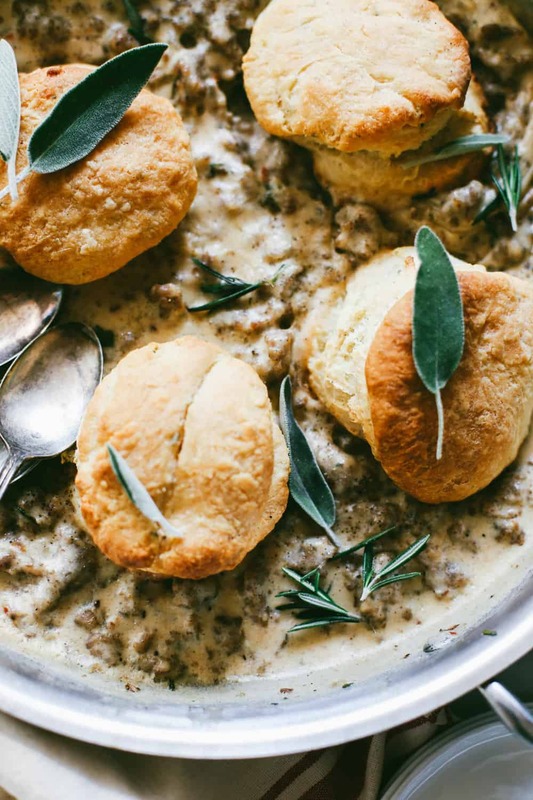 Add biscuits to gravy and serve family style. Next Post Say hello to our newest family member!